Machucha is the story of making and losing a friendship. It’s about all of the small and surprising moments of connection, and the surprising differences as well. About discovering that the way your family lives and what they consider normal is not normal for everyone else. Small kindness and revelations add up to form something stronger and warmer. But we understand the fragility of the relationship, too, that feeling of almost holding your breath, hoping and fearing, which is all part of the ordinary and extraordinary occurrence of making a friend when you’re twelve years old. That Machucha is set in Chile during the 1973 Coup d’état adds to the tension and heartbreak, but the real drama is one of friendship. We see the historical events as a child sees them, with confusion, fear, and a horrible sense of powerlessness. Gonzalo Infante is a student at a private Catholic school in Santiago. His family is wealthy but far from perfect, in ways that are also bewildering and unsettling to an uncomprehending boy. A handful of poorer students is introduced to the school, and they’re treated with inevitable mockery and bullying. Gonzalo befriends Machucha, a boy who lives in a shantytown. The story of their friendship is joyful and sad and haunting. The film is quiet and subtle but resonant. We see that all of the cruelty and brutality of our political world starts as suspicion and misunderstanding and fear of people who are different. And any hope for change comes from small moments of connection between ordinary people, and from empathy and friendship. I may have mentioned that I got a new food processor for Christmas. It’s a marvel! It’s so fast and quiet and efficient. I used it to slice these potatoes very thinly, and then I layered them with a sort of sauce of spinach, tomatoes, capers and olives. I also added some grated smoked gouda, but you could use mozzarella or goat cheese or leave the cheese out altogether and this would be vegan. I made mine quite shallow in a big French cake pan, but you could make it with more layers in a deeper pan. You might need to cook it longer, though. Here’s Bicicleta from the Machucha soundtrack. When the water is boiling, drop the potato slices in, and boil for 5-7 minutes, till they’re just slightly soft. Remove to a strainer, and drain completely. Drizzle a bit of olive oil in a baking dish. I used my wide deep French cake pan, but you can use any largish baking dish. If you use a smaller dish, pile everything higher with more layers, and you may need to cook it longer. Spread a thin layer of potatoes over, and scatter 1/2 of the spinach over that. Spread an even layer of 1/2 of the cheese over that. Add another layer of potatoes, more tomatoes, more cheese. 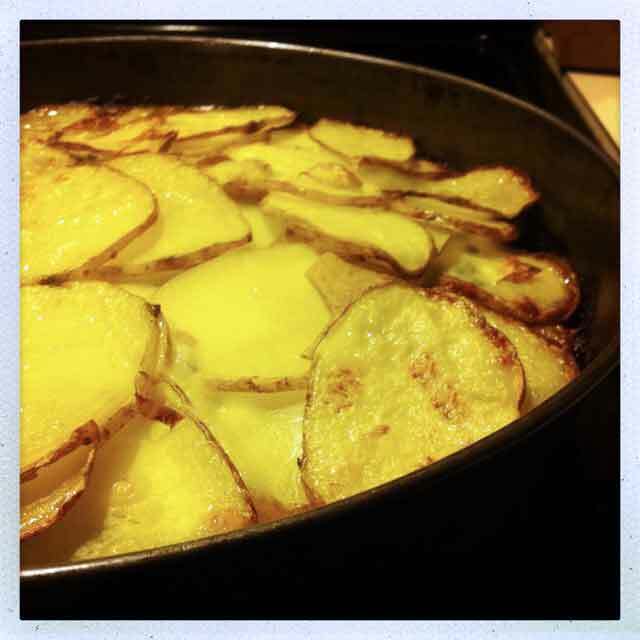 Top with a thin layer of potatoes. Drizzle olive oil over the surface. Bake for about 40 minutes, till the inside feels soft, and the top is starting to become brown and crispy. 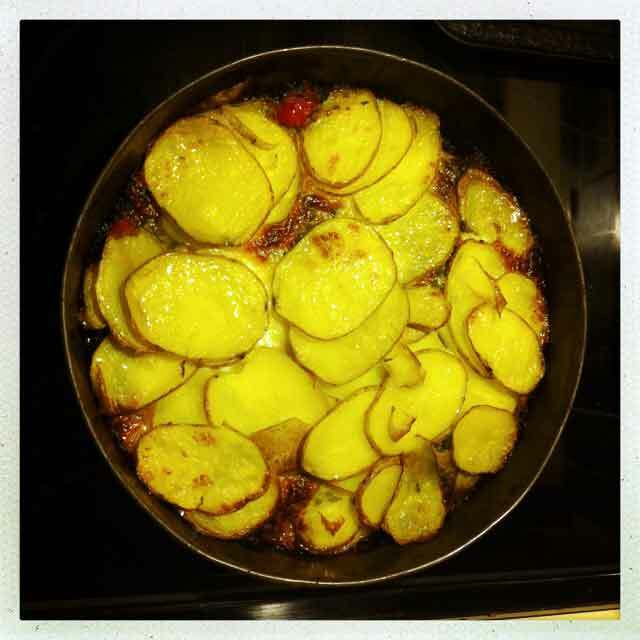 This entry was posted in potatoes, recipe, tomatoes, vegetable side dish and tagged capers, olives, potatoes spinach tomatoes, sliced baked potatoes by Claire. Bookmark the permalink. WOW! Finding different and delicious recipes – search no further.